The company is the “Expert in Fabricating sheet metal with more than 30 years of experiences”. - The company can make customized parts, equipments by the process of cutting, folding, bending, welding, perforating,laser, shaping, assembling, and coloring the sheet metal like iron and stainless steel. stack, transition, cyclone, etc. and other products made by metals and stainless steel to be used in the rice mill, sugar refinery, corn mill, coffe mill, animal feed mill, dust disposal and ventilation system. - The company manufactures tailored made products made by metal to be used in the construc-tion industry for instance portable stairs, drainage, metal model. - The company can design, manufacture and install structural work, and industrial machineries as required by the customers. for more information please see in our Product & Services. To become the leader in Sheet Metal Industry in Thailand and at the same time place high importance on the enhancement of company's competencies, personnel, and product quality. Continuous development will be carried on in order to meet client's expectations and to achieve highest customer satisfaction. 1. Conducting business based on honesty and morality. 2. To produce the highest quality products with strong service mind. 3. To promote and improve employee's knowledge and expertise that will lead to more efficient working processes thus benefit employee, company, clients and the society. 4. To develop and promote new technology in order to improve working processes and help the company in producing all kind of product range as required by the customers. 5. To be environmentally friendly by utilizing all resources at the best possible. 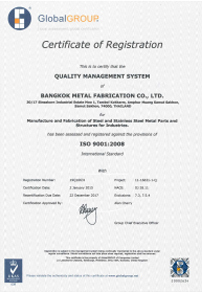 The Bangkok Metal Fabrication Co.,Ltd. was first established in 1971 trade under the name of Sin Seng Heng. The company started of as a small manufacturer for sheet metal products such as drainage pipe. metal pipe, and fuel tank. Since then the company maintains steady growth and continues to earn trust and respect from its customers and stakeholders. In 2001 the company changed its name to "The Bangkok Metal Fabrication Co.,Ltd.” and the company structure to meet with the international standards. In 2009 the company relocated the office and the factory to Sinsakorn Industrial Estate with total areas of 4 Rais. The new plant is well-equipped with up-to-date machineries that will allow the company to produce various product ranges. The company has a strong determination to stick to its vision to become a leading producer for sheet metal industry and achieve IS09001 to ensure the customers of the superb services and highest product quality provided at the on time manner and at reasonable price.